The World of Hyatt Credit Card from Chase offers an outstanding amount of value for frequent travelers: New cardholders are awarded ample points on a variety of travel purchases, including airfare and restaurant purchases. While some hotel loyalty programs have been riding the devaluation wagon for years – making their loyal patrons wonder how to use points that are worth less and less – the Hyatt Gold Passport program has exercised an enviable self-restraint. Hyatt, too, has raised redemption rates, but its last major devaluation occurred in 2013. It seems that unlike many other hotel chains, Hyatt understands that loyalty goes both ways. The Hyatt Gold Passport program consistently has earned rave reviews from its devoted fans. The World of Hyatt Credit Card packs quite a few benefits for a $95 annual fee. Even with an average earning scheme, the value is pretty high. If you value elite perks, the card awards you Discoverist status even if you’ve never stayed at Hyatt properties before. If you are working on getting into the top elite tier, the spending on the card can nudge you toward this goal as well. Chase recently rebranded the Hyatt card and with it come a few notable improvements including a slightly better earning rate that offers bonus points on public transit and gym membership and more points on Hyatt hotel stays. Even better, cardholders can now earn a second free hotel night when they spend $15,000 on the card in a year — this is an especially nice perk that can easily justify the card’s fee each year. To sweeten the deal, Chase is offering a sign-up bonus up to 50,000 points to new cardholders – 25,000 points if you spend $3,000 in the first three months and an additional 25,000 points if you spend $6,000 total in the first six months. That’s enough for 10 free nights at a category 1 hotel or two free nights at a category 7 hotel. The World of Hyatt card offers an annual bonus of up to two free nights each year. You get a certificate for one free night annually at a hotel in categories 1 through 4 – worth up to 15,000 points – for as long as you remain a card member. You can earn an additional free night certificate for a category 1 through 4 hotel if you spend $15,000 on you card in a year. Two free hotel nights each year is a pretty good reason to dole out the $95 fee for the card, just as long as you visit Hyatt hotels often enough to redeem the certificates before they expire. The earning scheme on the card is decent, if not spectacular. You get four points per dollar for Hyatt hotel purchases; two points for restaurant dining, directly purchased airfare, gym memberships, local transit and ride-sharing services; and one point for other purchases. The restaurant category in particular is a lucrative one and should help cardholders accumulate some extra points. The annual fee of $95 is a bit higher than average for a hotel co-branded credit card. However, the rewards and perks on this card more than outweigh the fee, making it well worth it for cardholders who do a moderate amount of spending and visit Hyatt brand hotels on a regular basis. Hyatt makes it fairly easy for cardholders to redeem rewards points. The Hyatt rewards chart is very sensible. Redemption rates begin at a very low 5,000 points for Category 1 hotels, and range up to 30,000 for the top-tier properties. Hyatt also includes a points-plus-cash option at participating properties, enabling you to cover part of your rewards stay with cash if you don’t have sufficient rewards points. The rates for points-plus-cash awards are reasonable, ranging between 2,500 points and 15,000 points. In addition, you can pay for suite upgrades with points, and the upgrade rates are reasonable as well. On the downside, Hyatt is a relatively small hotel chain, although it’s only “small” compared to behemoths like Marriott, Hilton or IHG. Hyatt still has about 640 hotels in 52 countries. Although you will not find as many options as with the larger chains, you still have the flexibility to travel to many diverse locations around the globe. Card members automatically qualify for Discoverist status with Hyatt. Unfortunately, Discoverist status does not offer a lot of great perks, but you will find some of them useful. You get a 10-percent bonus on rewards points with each hotel stay, expedited check-in, a preferred room when available, late checkout and premium in-room internet. The card also awards you qualifying nights toward higher status in the Hyatt loyalty program – an automatic five qualifying nights each year and two additional qualifying nights for each $5,000 that you spend on the card. 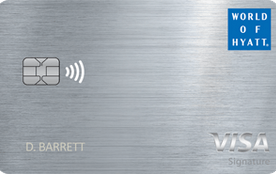 Why get the World of Hyatt Credit Card? You are a current Hyatt Gold Passport member or plan to travel to locations with Hyatt brand hotels. You are looking for a rewards card with a large sign-up bonus. You want automatic Discoverist status. Remember to spend $6,000 in the first six months to earn the full sign-up bonus. Consider applying with a spouse or partner to double all your bonuses. If you do so, you will get 120,000 points and up to four nights annually at hotels in categories 1 through 4. You can use the Hyatt Credit Card freely in foreign countries, since it doesn’t carry a foreign transaction fee.